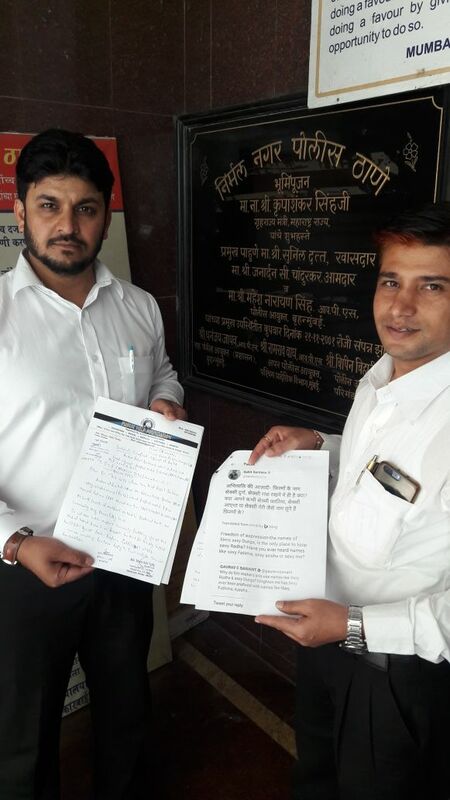 A city base NGO “Public Help Foundation” has lodged the complaint against National News Channel Anchor Rohit Sardana on his controversial tweet remark on Prophet Mohammad, with Mumbai police and Cyber Crime. Now police have taken it seriously and assured the complainant to file FIR against the culprit. Adv Shaan Illahi turky a well known social activist and president of the “Public Help Foundation ” protested against this News Anchor and demanded the action against him. ” whatever Mr Sardana tweeted it’s hurt our religious sentiments because of this tweet law and order problem can be disturbed so it’s my humble request to the Mumbai police to register an FIR under section 153 (A) of IPC so that the people should get justice.if police will not take our demand seriously we will go on undefinate hunger strike, Said Shaan Illahi turky. The complainant has also given a written complaint to DCP Zone 8, Mumbai Commissioner, Cyber cell, and Nirmal Nagar police station. This is not first case of the tweet controversy now it has become very common in social media. How the Mumbai police deals this case let’s see.